In a recent post at Benjamin Harvey's Emanata, the use of Twitter by art historians and students was highlighted. It outlined use of Twitter to monitor posting on the topic. Unfortunately, it also exposed an undercurrent of classroom boredom - which was perhaps better left undiscovered! This post has been created to highlight how Twitter, and RSS feeds can be used to create a powerful resource for web based research. It will also take a look at some art history resources online, both new and established - and examine some of their limitations. Whilst there are a plethora of academic databases for the humanities online, their relevance at actually looking at web sites - particularly blogs is quite sketchy! A recent post at Alexandra Korey's Arttrav introduced Arte.it, a crowd sourced search engine that focuses on Italian art. Arte.it is very pretty, but that's the best thing I can say at the moment. Early days yet - I hope it goes on to become a fantastic resource - which they can easily achieve if they embrace a collaborative approach. Whilst presently not focused on blogs, this project is in its early stages and can hopefully expand to incorporate these as well. Alexandra also mentioned a project I am working on, an art and history search engine and database. All I can reveal publicly at the moment is that it is in closed development/testing, and that I am very excited about it! Bloggers will finally have a viable resource for their content, without being subject to the whims of other organisations like Arte.it or Smarthistory, who despite their prominence do little to engage the prolific blogging community, comprised of academics, students, and passionate independents. In its current form - Smarthistory still has sufficient gaps to be limited as a resource. eg. a search for Giorgione will reveal no results. Their hesitance to incorporate third party databases or search engines hence provide no means to fill these gaps and many online users will hence track back to Google, Wiki and the Web Gallery of Art(WGA). Both Arte.it and Smarthistory seem to place great pride on the premium editorial nature of their content. 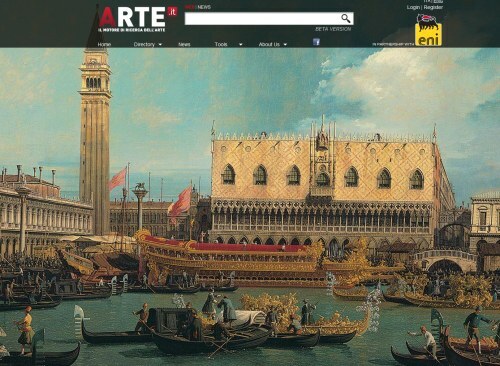 Yet, Arte.it is proliferated with generic biography and gallery sites in its search results. The fact that they chose this approach is unusual, as opposed to including quality blogs run by art history professors or independents who adhere to strict evidential standards. The Smarthistory audio entry for Caravaggio's 'Narcissus' in nice, but falls short of any academic standard of completeness. It also provides you with no additional options to overcome these limitations. Whilst Smarthistory does have a comments system that allows adding of information, it does not seem to be encouraged or monitored. To illustrate this - please see their piece on Caravaggio's 'Narcissus'. The information I supplied was not present in the original piece, and freely available from other resources that could have been linked to or referenced in this post. I think this part of Smarthistory is an untapped resource. I also unwittingly double posted the same response - which seems to have not been picked up. With some proper monitoring - comments or addition of references should be encouraged, and would surely add to the depth of the information presented. My chief advice is this: a policy based on exclusion is not one that lends itself to a thriving community of interdisciplinary collaboration. I expressed these concerns recently in a post at The Chronicle of Higher Education. I was delighted to receive a response from Smarthistory highlighting their plans to incorporate more collaborative features, including a YouTube channel. Let's hope they can move forward! Collaboration and networking are among the key features of the Web 2.0 philosophy, which comprises the underlying principles of the web we know today. It espouses use of internet technology to encourage participation and collaboration, and is at the heart of the success of the scientific community's online presence as well as that of social networking platforms. A wonderful example of Web 2.0 in action is Twitter. As my interview has revealed, I was remarkably apprehensive about the social networking craze that has taken over the world. A lot of it seemed so focused on the mundane and commonplace - many would feel that we do not need this level of personal interaction with strangers. Creating viable online networks needs to be action oriented, just as viable networks in commerce and trade have existed for centuries. When Twitter first started, its short- form nature was a bit of a shock - I must admit I did not immediately recognise its value. For those that do not know what it is, Twitter is essentially a messaging platform, where messages are limited to 140 characters. It's similar to broadcasting text messages on a phone to many recipients, or a mini email service, as it includes the option to reply to people directly. Unlike Facebook, Twitter is not centred on your status or mood, or making a statement about 'liking' a person or not, and does not even require you to be a member if you would like to keep track of tweets on a subject or person. It has a 'following' system which merely indicates whose messages(or Tweets) you are keeping track of and who is following your messages. 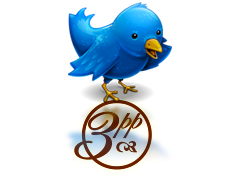 In a characteristic display of encouragement, the amazing Monica Bowen was 3PP's first official follower, having found 3PP via the art history newsletter and my exciting Botticelli plant adventure. It was observing Monica's posts that I began to get an inkling of Twitter as a resource sharing platform. She would not only post links to her articles at Alberti's Window, but also to other blogs and resource sites. Hence, as tech savvy as I may be - credit really should go to Monica for being one of the first generation of art historians promoting their blog on Twitter. Later of course I discovered others, and am now slowly collating art and history related twitter resources. I have created several lists, including one for art historians, which will be replenished every time I encounter a professional art historian or art history student on twitter. For a more populous list of general art history related tweeters, I also recommend this list at wefollow. If you are not on this list and tweet about art history, feel free to add yourself to it! In recent weeks, I have got an increasing sense that the humanities have found a special home on Twitter. Never have I seen such a flurry of constructive activity and resource sharing. Those who are dismissive of it simply need to know that it can be an excellent resource if you make it work for you. It is an amazing platform to link to information and other people. In an upcoming post, I will demonstrate how posts made on Twitter not only suggested a new avenue of research but also led me to the scientific verification of the item in question - a plant depicted in a Botticelli painting. I often get questions about RSS feeds. Some of you may know that RSS generically describes 'Really Simple Syndication' and is indicated by the symbol above. What some do not understand is its power to create your own pool of searchable data, allowing you to quickly find content containing specific topics. Most sites, particularly blogs have RSS feeds. They can usually be activated by clicking an RSS symbol or link either on that webpage or one that is extracted by the browser. A site's RSS will show a summary of that sites content, such as post titles, or in some instances, the entire post. This is set by the site themselves and cannot be changed. Some site authors like to try lure people to their site by showing you only the title or a snippet of the post - whereas others(myself included) allow the full content of posts to be extracted into the feed so as to allow remote viewing and enrich search results. RSS feeds can be collected for viewing in an RSS reader. There are many platforms that can do this - ranging from email programs like Outlook to web browsers themselves. One of the most powerful and widely used RSS platforms is Google's Reader, or GReader. It is web based, so requires no extra installation, merely a google account to access. With regards to Twitter and RSS, one of its interesting features is that you can subscribe to twitter feeds via RSS, regardless of whether you have a twitter account or not. Whilst you won't be able to interact with people, you can at least keep up with the links and resources they are sharing. I recommend making a 'Twitter Resources' folder in GReader so you can track and highlight information that is relevant to you. Even for those with twitter accounts, this is a good way of isolating resources into one place you can track them without actually 'following' that person and having their tweets show up in your stream. This would be my take home message to those thinking about it: you can make it work for you. Twitter is not about a closed information stream(like Facebook) and can be used to find and get quick answers from some very knowledgeable people. eg. first tweet that 'mentioned' me was in June this year and was confirmation of the mysterious source of botanical facts in my Botticelli investigation. If anyone has anyone questions or would like tips on using GReader for this purpose, leave a comment or send me an email(or tweet). I'm just blown away by your presentation skills, and your generosity in spending so much time on the on-line interaction debate. I'm afraid that I'm not using Twitter to its best advantage. I mainly use it to flag up interesting sites, events as it's so quick. I do have a lot of people following AHT on Twitter, but haven't really caught up with the conversation. Im worried sometimes about the triviality factor in Twitter. You really need a focus to make it work. This is getting off message a bit but the students over here are using it v effectively to coordinate their campaign.Social networking is effective, and worth it, when you have a a cause or purpose. I'm calling it the "online enlightenment project" which captures the educational as well as libertarian aspects of web learning. Paula tells me I've invented a new meme. We shall see. I haven't really used Smarthistory too much, so didn't know about the limitations. Thanks for pointing them out. I'd like to use that kind of approach, maybe podcasts, but I need to learn more about it. I've only been using google reader for a couple of weeks and it's already transformed the way I use the internet. It's definitely helped me be much more efficient with keeping track of blogs, news sources, feeds, etc. Sometimes twitter feels like you're talking into a vast empty and unresponsive space, at other times that people are actually listening (and responding) to what you're saying. It's an odd and variable experience, but generally very valuable. The hashtag and the list are its most useful tools, I think. I'm generally very positive about smarthistory, but feel that the stress on conversation is largely rhetorical at the moment. (It's more of a description of their podcasts rather than of their current commitment to dialog with users.) However, what they're doing is amazingly generous and useful. I feel like it could be an amazing supplement to a basic art history survey text. Soon, I might consider just replacing the survey text with smarthistory. But it's hard to find specific information (say, the name of a patron) by listening to a podcast. Still easier to browse through text--that's one of my current reservations. Of course, the really interesting and important topic you're touching on is the issue of collaboration in the humanities. Unfortunately, the online environment inherits the characteristics of the old disciplines. Collaborative research has (I think?) always been the norm in the sciences, and rare in the humanities. Think of the co-authored research paper. Hopefully, this is an opportunity for changing this model. We need to provide incentives for researchers in the humanities to embrace these new possibilities, and I think that requires new approaches to assessing research. Unfortunately, promotion and tenure committees aren't renowned for their swiftness in recognizing new venues. As far as I'm aware, they still give most weight to peer reviewed books and articles. There are good reasons for this. It's incumbent for profs lucky enough to have tenure (like myself), to begin rethinking the p&t process with the web in mind. Oh, and I can't wait to find out more about your art and history search engine. Very exciting news. Cheers for the feedback David and Ben! I think the most crucial aspect of any online initiative is user feedback. Hence, as you use sites such as Smarthistory, Arte.it etc make sure you let its developers know your experiences - even if you think there are not entirely positive. This is the only way site developers can work to make their content more suitable for the end users, be they educators like yourselves, web researchers like me, or students. Great achievements do not eventuate because of a series of pats on the back - but lots of feedback, hard work, and action! Sitting on the scientific side of the fence and knowing what we have, I know sorely what the art history community is lacking - a unified set of resources accessible to professionals and punters alike. It's a wonderful goal to work towards. This is such a great post. I'm sorry it's taken me so long to comment - I've been swamped over the Thanksgiving holiday. Like David, I'm amazed at your dedication and the time that you put into discussing the online interaction debate. Great work, Hasan. You're very kind to give me credit for my Twitter usage. I actually was encouraged to use Twitter several times before I began my account, but I was worried that not enough art lovers/art historians were interested in Twitter. I have been proven wrong, though. My readership accelerated dramatically when I began using Twitter - it was very encouraging to see how many "artsy" people use the network for communication. As an academic who is encouraged to "keep on top" of the discipline, I have found that Twitter is one of the the best ways to learn about new findings, arguments, etc. As for Smarthistory, I have a love/hate relationship with that site. For the most part, I find it to be helpful, but I a few times I have come across contradictory and misleading information (even within the same post! I have seen Smarthistory video presentations which state something different than what is written in the accompanying text.). I enjoyed reading on this post an informative comment by a reader Livia. From what I can tell, her comment seems accurate. However, I would have liked Smarthistory to have backed up or asserted the information that Livia presented. Am I simply to suppose the information is correct, since Smarthistory allows it to be included with the post? I wonder if the contributors to these should posts be assigned responsibility to monitor comments? Cheers for the amazing feedback M.
I think we all want to see Smarthistory grow and become something fantastic - if they concentrated on working on some of the issues highlighted, it would be a supremely valuable, high quality resource. Discrepancies like the one you have outlined, simply need to be sorted if they want to take that next step. Thanks for the comments about Smarthistory - it's always good to know that people are using Smarthistory and find value in it. For the record, SH is run by 3 volunteers who all have day jobs -- so it's a labor of love, and although we respond to comments as much as we can, we're not always able to do as much as we'd like. We have focused on adding content since this is what users have asked for most. As you know, we're looking for art historians to volunteer to write additional content that would complement the videos, and other types of volunteer assistance are also welcome. And we are always open to suggestions about how we can improve what we do! Thanks for the comments Juliana!